A classical metastable state possesses a local free energy minimum at infinite sizes, but not a global one. This concept is phase size independent. We have studied a number of experimental results and proposed a new concept that there exists a wide range of metastable states in polymers on different length scales where their metastability is critically determined by the phase size and dimensionality. Metastable states are also observed in phase transformations that are kinetically impeded on the pathway to thermodynamic equilibrium. This was illustrated in structural and morphological investigations of crystallization and mesophase transitions, liquid-liquid phase separation, vitrification and gel formation, as well as combinations of these transformation processes. The phase behaviours in polymers are thus dominated by interlinks of metastable states on different length scales. This concept successfully explains many experimental observations and provides a new way to connect different aspects of polymer physics. 1.1. Phases in single component systems. 1.2. Phase transitions in single component systems. 2. Thermodynamics and kinetics of phase transitions. 2.1. Thermodynamics of phase transitions in single component systems. 2.2. Kinetic aspects of phase transitions in single component systems. 2.3. Phase and phase transitions in mutiple component systems. 3. Concepts of metastable states. 3.1. Ostwald’s stage rule and definition of a metastable state. 3.2. Examples of metastable states in phase transitions. 3.3. Appearance of metastable states controlled by competing kinetics. 3.4. What are the limitations of this concept? 4. Metastable states in phase transitions of polymers. 4.1. Supercooled liquids and crystallization. 4.2. Superheated crystals and crystal melting. 4.3. Metastable states in phase separated polymer mixtures and copolymers. 5. 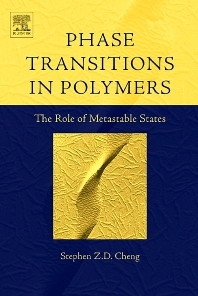 Metastable states observed due to phase transformation kinetics in polymers. 5.1. Appearance of metastable states based on their crystal nucleation barriers. 5.2. Polymorphs and their competing formation kientics. 5.3. Monotropic phase transitions in polymers. 5.4. Environment induced metastable phases. 6. Interdependence of metastable states on different length scales in polymers. 6.1. Combining phase size effect with polymorphs. 6.2. Liquid-liquid phase separation coupled with vitrification. 6.3. Liquid-liquid phase separation coupled with crystallization. 6.4. Liquid-liquid phase separation associated with gelation and crystallization. 7. Outlook - A personal view.